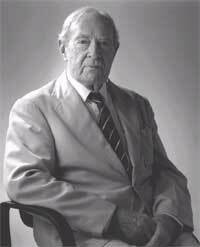 The Hanson Institute (originally the Hanson Centre for Cancer Research) was named after Dr Bertram Speakman HANSON, CMG, DSO, OBE, MID, ED. The following text is taken from the first Annual Review (1991-1992) of the Hanson Centre for Cancer Research, which became the Hanson Institute in 2001. Doctor Bertram Speakman (Bill) Hanson graduated in medicine from the University of Adelaide in 1928 and spent a year as house surgeon at the Royal Adelaide Hospital before becoming its foundation Radium Registrar in 1930. He became Honorary Radiotherapist at the Royal Adelaide Hospital in 1952 and Senior Honorary Radiotherapist from 1953 until his so-called ‘retirement’ in 1965; since then to the present he has been Honorary Consultant Radiotherapist. In 1955 he was appointed deputy Chairman of the Anti-Cancer Campaign Committee of the University of Adelaide and was its Chairman from 1956 to 1961. During that period he was largely instrumental in the re-organisation of the Anti-Cancer Campaign Committee which in 1962 became the University of Adelaide Anti-Cancer Foundation. Dr Hanson became the Deputy Chairman of the Anti-Cancer Foundation when it was first formed. He held that position continuously until 1980 when he was appointed Chairman, in which capacity he served until 1986. He was Chairman of the Executive Board of the Foundation from its inception until 1973. Dr Hanson played an important role in the formation of the Australian Cancer Society in 1960 and he was its foundation Vice-President. He was its President from 1962 to 1964, after which he continued to serve that Society over many years. In recognition of his outstanding service, he was awarded the Gold Medal of the Australian Cancer Society in 1979. Dr Hanson has also given notable service to many other organisations and in recognition of his extensive services to medicine he was awarded the C.M.G. in 1963. In all of these professional activities as well as many other personal interests, Dr Hanson enhanced the reputation of the University of Adelaide, which enjoyed the benefit of his great service over fifty years. The University honoured Dr Hanson with the distinguished award of the degree of Doctor of the University in 1985 on the occasion of the Commemoration Ceremony which celebrated the Centenary of the Faculty of Medicine in the University of Adelaide. Dr Hanson has devoted the whole of his working life, directly and indirectly, to the care of cancer patients in South Australia. It is fitting, therefore, that the new centre for cancer research should recognise his major contribution by bearing his name.